If the image that you have in your head of this small southern city is at all influenced by memories of the ‘60’s you could be forgiven for being wary. History is in the air here in a real way, from the Montgomery bus boycott and the early legacy of Rev. Martin Luther King, but this small Southern city is also forward-looking. The history of the city is still the main draw here and Montgomery has a lot of it, much of it layered in fascinating ways. There are several locations in town where sites of atrocity and devastation overlap with those of beauty, hope and upliftment. Perhaps the most wonderful example of this is the Dexter Avenue King Memorial Baptist Church. This beautiful National Historic Landmark was built in 1879 on the site of a former slave pen. Now however, it is best known as one of the centerpieces of the Civil Rights Movement. The basement of the church served as the planning space for the Montgomery bus boycott and was, of course, presided over by the church’s then, nearly brand-new pastor, Rev. Dr. Martin Luther King, Jr. A tour of the church is an uplifting experience that covers the history of the church, it’s role as the launchpad of the civil rights movement and its current significance within the African American community both in Montgomery and beyond. For those interested in diving further into this important time in American history, the Dexter Parsonage Museum, which takes visitors through the home that MLK lived in during the tumultuous times during and after the bus boycott, is open for tours. You can also learn more about the woman that launched the boycott at the Rosa Parks Museum, just a few blocks away from the church. 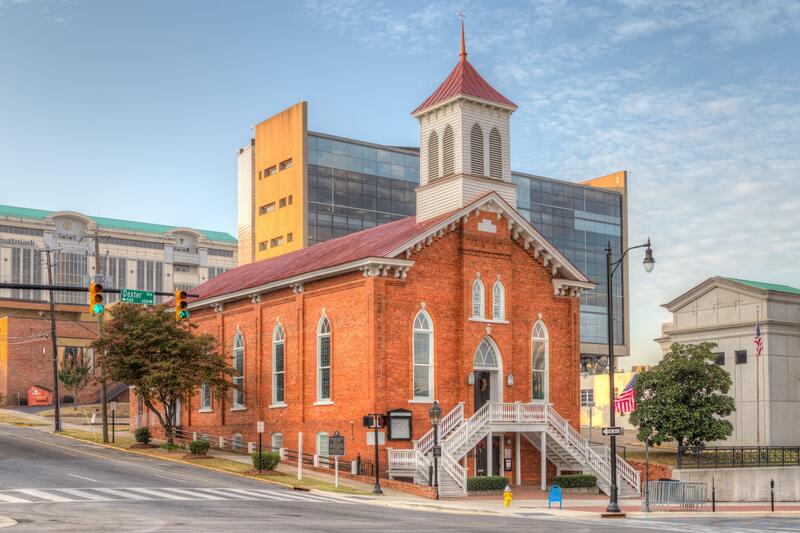 The whole of downtown Montgomery is an extremely walkable space, with many of its attractions, particularly those associated with the civil rights movement, just a few blocks from each other. The downtown is in the middle of major revitalization that will include new hotels and major smart city initiatives, not to mention a variety of delicious food options. Southern food is definitely a must-do here. Cahawba House in particular is worth a visit for a classic southern “meat and three” meal; however this is far from your only option. Montgomery has a ton of choices, from the upscale southern-inspired fare at Central, to the hot dogs at Chris’, the oldest family-owned restaurant in the city. If you’re thinking of a visit to Montgomery, you’ve probably already thought about making plans to see the newly opened Legacy Museum and National Memorial for Peace and Justice. The new museum and memorial made headlines around the world for their in-depth and stark look at the true legacy of slavery and oppression, and the way this injustice continues to affect African Americans today. Founded by Bryan Stevenson of the Equal Justice Initiative, the museum had a massive opening in April 2018 that was attended by thousands. It’s a must-see for anyone visiting Montgomery but be prepared to take some time afterwards to process what you’ve learned as it can leave visitors feeling, understandably, shaken. Interactive videos, holograms and other exhibits help to humanize people and events that are too often spoken about in the abstract. Overall, the city of Montgomery is growing, not just in terms of numbers and tourist offerings, but also in finding productive ways to look at its past in order to move toward a more inclusive future. Witnessing this process is well worth the trip.